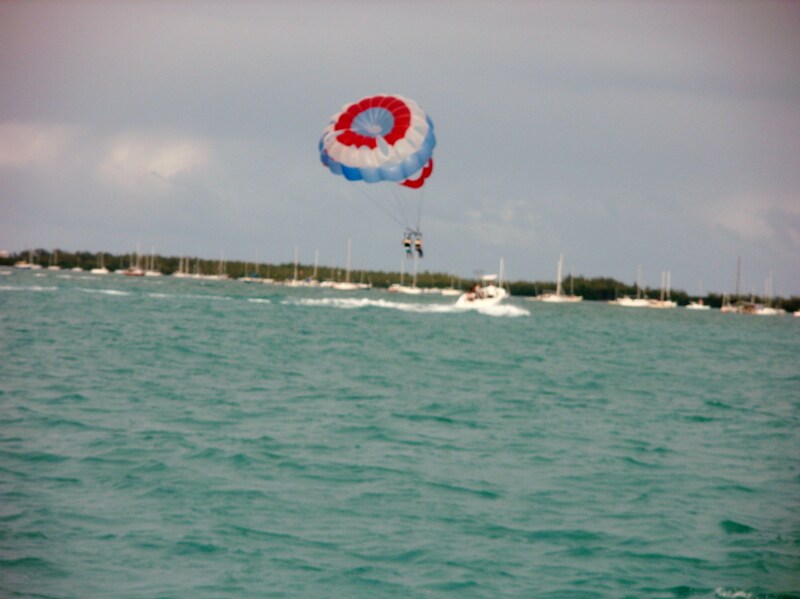 If you have the chance to go parasailing, whether you’re on a cruise excursion or just a regular beach vacation, do it! It is the most exhilaratingly peaceful experience you can imagine. We chose to go up on a seat for 3 people: me and my husband with our daughter in between. We were hooked together onto a bar and our boat sped out across the water. Then slowly, we began to lift high into the sky as our speedboat continued chopping through the water. Our feet dangled below us and we seemed to hang precariously in the air. One tip back and I felt like we would have fallen, fallen, fallen down into the water. So we hung on tight. What I didn’t expect was the stillness and quiet up there. We didn’t seem that high. I thought we’d hear all the life going on below us and close to shore, but it was calm and quiet up there as we sat on a swing held up by a parachute. The ride was over all-too-quickly. I think the standard time in the air is anywhere from 7-10 minutes. Our boat guides let us dip down into the water as they towed us back in. I wanted to beg them to let me up again. I loved it. One of my favorite beach activities ever. If you have the chance, do it. You never cease to amaze me. I would be terrified to do this (I’m afraid on a Ferris Wheel). You make it sound so wonderful, I wish I could do it! Thanks, Maddie. Ferris wheels scare me to death, too. I always forget until I’m on them. But parasailing didn’t scare me. I tried this last summer and ended up loving it too. I was initially nervous, but surprisingly found it to be really peaceful and soothing as well. In fact, I could’ve stayed up there for another hour. I was nervous, too, until we started to go airborne. I could have stayed up there all day. Thanks for the recommendation! I look forward to hearing the quiet! I’ve always wanted to try water-skiing. Hopefully the experience will be good when I do. It’ll be on a lake, not the ocean, so that should help.